AVENGERS ROLL CALL: Ant-Man and Wasp were both founding Avengers in Avengers #1 (1963). Hawkeye and Scarlet Witch both joined the team in Avengers #16 (1965), Vision in Avengers #58 (1968), Wonder Man in Avengers #158 (1977) as a provisional member and Avengers #181 (1979) as a full member, Falcon in Avengers #184 (1979) and Tigra in Avengers #211 (1981). The Avengers made their debut in Marvel Comics’ Avengers #1, September, 1963, written by Stan Lee and drawn by Jack Kirby. The book primarily consisted of characters previously introduced in Marvel’s various books since the company’s revitalization with Fantastic Four #1 in 1961. 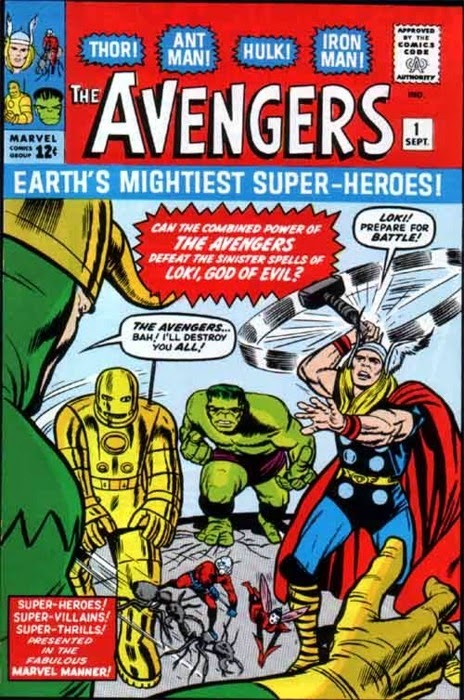 Iron Man, Hulk, Thor, Ant-Man and Wasp vs. Loki in Avengers #1. The evil Asgardian god of mischief Loki (Journey Into Mystery #85, 1962) sought revenge against his half-brother, the thunder god Thor (Journey Into Mystery #83, 1962), for his constant interference in Loki’s schemes. Loki pitted Thor against the Hulk (The Incredible Hulk vol. 1 #1, 1962), the alter-ego of scientist Bruce Banner who emerged whenever Bruce got angry after exposure to gamma radiation. However, Loki’s scheme backfired when he inadvertently involved billionaire inventor Tony Stark, who created a suit of armor to become Iron Man (Tales of Suspense #39, 1963), scientist Henry Pym, whose matter-shrinking Pym Particles and ant communicating helmet let him become Ant-Man (Tales to Astonish #27, 1962), and heiress Janet Van Dyne, Henry’s girlfriend who sprouted synthetic wings when she used Pym Particles to shrink as the Wasp (Tales to Astonish #44, 1963). Together with the Hulk, the heroes banded together and defeated Loki. Deciding they made a great team, the Avengers was born, eventually becoming the New York Yankees of the superhero set. In 1997, Fox was experiencing a decline in its ratings as ABC, Kids' WB, Nickelodeon and the Disney Channel were delivering a broad slate of programs and aggressively marketing them to their audiences. Roland Poindexter, Vice President and Head of Programming at Fox Kids, recognized that his network had become known for its action-adventure shows, particularly based on Marvel properties. 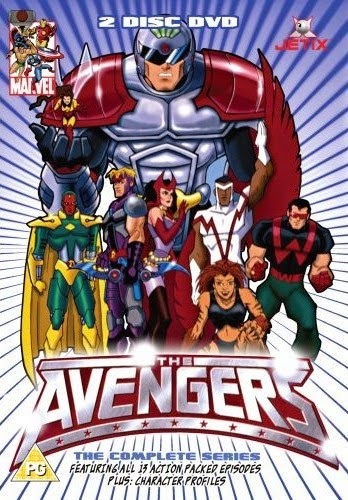 He approached X-Men: The Animated Series writers Robert N. Skir and Marty Isenberg to develop a proposal for an Avengers series. They laid out a detailed 13-episode story arc in their series bible, but Fox was more interested in pursuing a Captain America series. 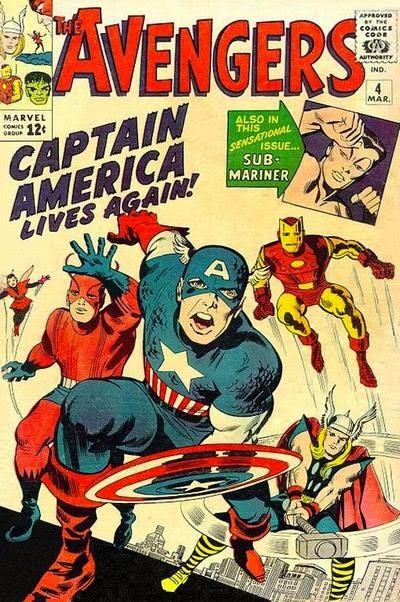 Captain America returns to comic in 1964's Avengers #4. Cap, first debuting during Marvel’s days as Timely in 1941’s Captain America Comics #1, was scrawny Steve Rogers who was given a Super Soldier formula to turn him into a soldier at the peak of human development. He disappeared from publication when superhero comics went into decline in the 1950s, his own book being cancelled for the second time in 1954. Lee and Kirby later revived the character in Avengers #4 in 1964; his absence explained by his been frozen in suspended animation after World War II, found by the Avengers, and thawed out in the then-present day. Captain America makes an appearance. Neither show went into development as Marvel had gone into bankruptcy during the comics bust of the 1990s. When Marvel’s financial troubles stabilized in 1998, Poindexter revisited the idea and brought in X-Men series story editor Eric Lewald and his wife Julia to serve as story editors for the show. In 1999, Fox green-lit the series and Ron Myrick was hired to oversee the show’s visual development. It was decided to leave out the “big three” Avengers--Captain America, Iron Man and Thor--in order recapture the popularity of the team when those heroes weren’t members in the comics and to focus on a line-up of more flawed characters for greater story potential without their risking being overshadowed by the bigger names. The characters did make an appearance at the end of the opening sequence throughout the show’s run. Hawkeye, Tigra, Wasp, Ant-Man, Wonder Man, Scarlet Witch, Falcon and the Vision. The team’s line-up was loosely borrowed from the Avengers spin-off West Coast Avengers (later renamed Avengers West Coast). Founding Avenger Ant-Man (Rod Wilson) was made the leader of the team, and was joined by fellow founder Wasp (Linda Ballentyne). Filling out the roster was Captain America’s former partner Sam Wilson, aka Falcon (Martin Roach), who could fly via a special harness and communicate with birds—in particular his falcon Redwing; Clint Barton, aka Hawkeye (Tony Daniels), a former criminal and master bowman; Wanda Maximoff, aka the mutant Scarlet Witch (Stavroula Logothettis), daughter of Magneto with hex-casting abilities that she activates by saying “Winds of destiny, change!”; Greer Nelson, aka Tigra (Lenore Zann), an athlete who underwent genetic treatments to give her an edge that ended up transformer her (an origin different from the comics); the synthezoid android The Vision (Ron Ruben), who was created by Ultron (John Stocker) to destroy the Avengers and turned to their side by being given Wonder Man’s memories; and Simon Williams, aka Wonder Man (Hamish McEwan), whose ionic powers gave him super strength, flight, near-invulnerability and energy blasts, and who spent half the series in a coma after being attacked by Vision. Supporting the team was Edwin Jarvis (Graham Harley), the team’s butler who maintained their headquarters. Captain America (Dan Chameroy) and Iron Man (Francis Diakowsky) each made a guest appearance on the show, but Thor never appeared outside of a cameo in the opening sequence. The series’ main focus was the team trying to live up the legacy established by the big three, particularly Ant-Man who, as team leader, was following in Captain America’s very large footsteps. The "Big Three" oversee operations in spirit, if not presence. A major difference from the source material was the introduction of special armor for Ant-Man, Wasp, Falcon and Hawkeye, which they donned in repeated Super Sentai-inspired transformation sequences. Although no explanation was given on the show itself for the armor, the tie-in comic series attempted to do so by setting its first two issues before the premiere. The story saw the Avengers laid low by an early version of Ultron, a robot created by Pym that became genocidal against all living things. As a result, Pym developed their armor to give them more protection and strength in battle, based on the armor he created for himself after his legs were broken by Dragon Man. The series was also set 25 years in the future, accounting for their armor, futuristic technology, and how some of the settings looked. The show debuted on Fox on October 30th, 1999, to generally negative reactions. Early information about the show’s line-up and changes had left potential viewers cold, and seeing it did nothing to change that perception. Low-ratings saw the series cancelled after its initial 13 episodes, scrapping plans producers had for the second season which would have included appearances by the X-Men (making use of the fact both shows shared some of the same cast), the Hulk, and Thor. To date, the series has only been released to home video several times internationally but has yet to receive a release in America. 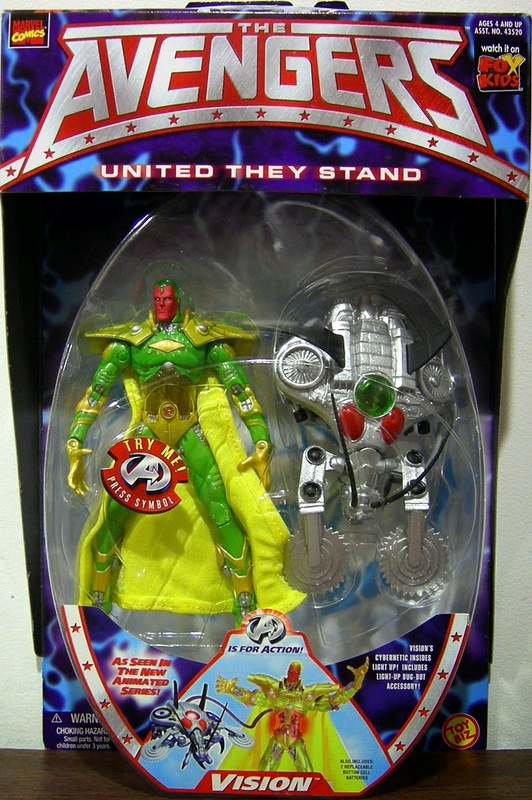 During the run, Toy Biz produced a line of action figures and two figures based on the show, which included Captain America despite his diminished role. The previously mentioned comic series ran longer than the show, ending that June after only seven issues. During its run, it featured additional characters and groups that didn’t appear in the show, including Black Widow, Hydra, Doctor Doom and A.I.M.. It wouldn’t be until 2008’s Iron Man movie, and the introduction of the Marvel Cinematic Universe, that The Avengers franchise would start getting renewed attention from Marvel and fans. 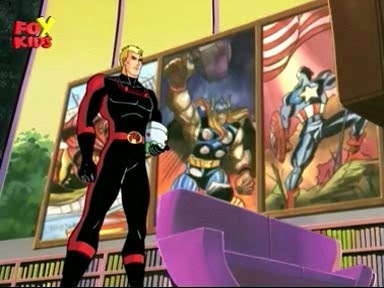 The comics were revitalized and the team given a new cartoon with Avengers: Earth’s Mightiest Heroes. 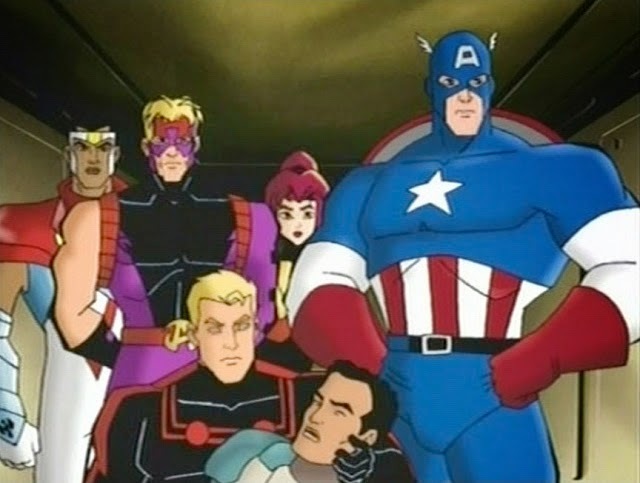 After the release of Marvel’s The Avengers (so called to differentiate it from the British program and 1998 movie), the cartoon was retooled into Avengers Assemble with a line-up closer reflecting the one featured in the film. “Avengers Assemble, Part One” (10/30/99) – Ultron creates the Vision to destroy Ant-Man, but Wonder Man ends up wounded. “Avengers Assemble, Part Two” (11/6/99) – The Avengers defeat Ultron and reprogram Vision with some of Wonder Man’s mind. He and Falcon join the team. “Kang” (11/13/99) – Kang seeks an obelisk to help him return to the future and rule its people, but the Avengers set out to stop him. “Comes a Swordsman” (11/27/99) – Hawkeye must face off against his mentor Swordsman while the Avengers battle Ringmaster and his Circus of Crime. “Remnants” (12/4/99) – Ultron’s previous experiments threaten to cause a nuclear war. “Command Decision” (12/11/99) – The Avengers team-up with Captain America to stop the Masters of Evil from stealing dangerous government weapons. “To Rule Atlantis” (1/15/00) – Namor joins the Avengers in stopping Attuma from creating earthquakes in an attempt to conquer Atlantis. “Shooting Stars” (1/22/00) – The Avengers call Iron Man for help against the criminal organization Zodiac as they attempt to blackmail Earth’s cities. “What a Vision Has to Do” (1/29/00) – Vision allows himself to be captured by Ultron so that the Avengers can follow them to his base. “Egg-Streme Vengeance” (2/5/00) – Egghead sabotages Ant-Man’s Pym particles, causing him to shrink out of existence. “The Sorceress’ Apprentice” (2/12/00) – Scarlet Witch seeks help for Wonder Man, but she ends up kidnapped by the Salem’s Seven while the Avengers are busy battling Grim Reaper. “Earth and Fire, Part One” (2/19/00) – Wasp’s father’s old business partner, Cornelius Van Lundt, is causing dangerous disruptions to Earth’s magnetic fields. “Earth and Fire, Part Two” (2/26/00) – The Avengers battle the Zodiac over an ancient meteorite.